Achilles is a man of many passions. He is often descibed as quick, or “swift-footed.” For Achilles, the warrior, his life is short and grim. His unfettered rage is drawn out and drawn towards those who have offended him, especially those who have offended him most recently. He knows only friends and enemies. Rather than pursuing a strategy of diplomacy, of weighing the advantages and disadvantages among both friends and enemies, Achilles knows only total war. Friends and enemies are without qualifications -they are, so to speak, black and white to a warrior like Achilles. Achilles also demands moral perfection. He expresses dislike for men who give speeches and commit acts that do not reflect the truth concealed in their hearts. Instead, he looks for authenticity. Any lie is a bad lie for Achilles -he does not approve of such a thing as a noble lie. He is skeptical of poets, tactful poets like Odysseus. This is why he fails in the realm of politics. He lacks the will to negotiate with Agamemnon, and his decision leaves his Myrmidon men muttering to themselves. Odysseus, on the other hand, is filled nostos, the root for nostalgia meaning homecoming. His deep longing is to return home to reclaim the house of his fathers. Unlike Achilles, who is described as longing to return home to garden and live a long but quiet life, Odysseus longs to return home to continue to lead his family. The Iliad is a text explicitly dedicated to the passion, the rage, of Achilles. The bard calls to the goddess in the Iliad, but in the Odyssey, he calls to the Muse about “a man.” Who is this man, to whom an entire Homeric epic is dedicated? In the second line of the Odyssey, Odysseus is identified as the winner of the Trojan war. This is of course contra Achilles, the great warrior, whose rage is not credited with winning the war. Instead Achilles’s rage is characterized as leading many Achaeans to their death. The killing of Hector is inferior to the wooden horse ploy in leveling the city of Priam. Odysseus, on the other hand, is identified as the man of many twists and turns. He speaks in different ways to different groups. Toward the noisy masses of men, like Thersites, he forcibly punishes them. Toward men of renown, such as Agamemnon, he persuades them, appealing to their capacity for reason. As an example, Helen explains to King Priam that Odysseus’s wise council is second only to Zeus. He is crafty and cunning, a man of many disguises. He is also a dangerous poet to his foes, a pleasant liar who speaks and acts with reason, rather than passion. He is favored by Athena, goddess of wisdom. Perhaps the differing educations of both Achilles and Odysseus bear significance on their unique distinctions. Achilles is a properly educated and reared man. 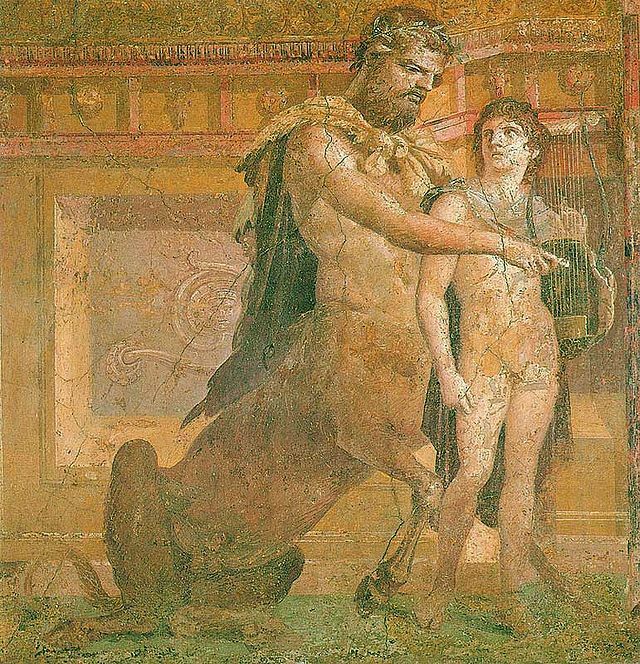 The centaur, Chiron, is the legendary teacher who educates Achilles as his own disciple. Achilles, however, can only be reared to a certain limit. His heel, after all, is the only body part not dipped into the river Styx by his mother Thetis. Whereas Odysseus received no formal education, he was presumably trained in the art of war, and also in music and poetry. In addition Odysseus, who is perhaps a genius, has the gift of interpretation. While Achilles responds to events, typically with rage, Odysseus analyzes and then responds. For this reason, Odysseus endures and Achilles lives a short life but memorable life. Now to turn the page, the two heroes notably share a common bond on this final point regarding durability. Achilles strives to make an enduring name for him by, somewhat ironically, sacrificing his own life. He knows, according to the prophecy, that by killing Hector, he will remain in Ilium and never return home with the Myrmidons again. Yet he is driven by his ceaseless rage. Similarly, Odysseus is concerned with his name. For in an age of endless challenges, war and contest are the ways for man to build a lasting name for himself. Odysseus, who nearly drowns at the hands of Poseidon, cries out that his story be not forgotten. It is good and fitting that the life of a man should emulate an epic, such as the epics of Homer, rather than a tragedy, perhaps of those written by Euripides. It is better to be remembered triumphantly and heroically than it is to remembered as pitiable and tragic. However, to be remembered is what is most important to the Achaean heroes, and this need to search for the enduring qualities in life is a characteristic lesson that is of value to learn from Homer, the teacher of the Greeks.